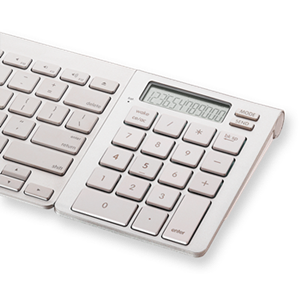 iCalc is a specially designed keypad for Apples Aluminum style Wireless keyboard, basically iCalc is a Bluetooth Calculator with screen with dedicated numeric keypad, the device has an ability to magnetically attach to Apples Keyboard. iCalc can be very useful to enter data into spreadsheets , accounting documents and other economics related software’s. iCalc Bluetooth calculator has 12 digits numeric buttons and there is Mode button which makes user life easy to switch between Keypad and Calculator. As it’s a Bluetooth based device so it uses Bluetooth to connect to your Mac OS. iCalc Bluetooth Calculator Keypad will be perfect if you don’t want to run a calculator app on your computer each time you want to calculate something. 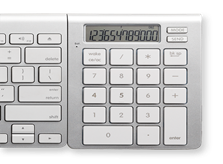 iCalc is also compatible with windows operating systems namely Windows XP , Windows 7 and Windows 8.
iCalc Bluetooth Calculator Keypad is priced at $59.99. If you want to know more about iCalc or want to purchase this gadget visit SMKLINK website click here.